It is almost impossible to talk about the Oklahoma City food and restaurant scene without mentioning the name Fleischfresser. As the head chef at Vast, Kurt Fleischfresser shaped the OKC metro’s fine dining and culinary culture over the past 30 years. His Citizen Potawatomi children Kyle and Allie hope to keep the Fleischfresser reputation going into the next generation. Kyle, Allie and their mother Jayne Fleischfresser are Tescier descendants. Through the years, both siblings found their respective callings in the OKC restaurant scene. Today, Kyle is the general manager of The Hutch on Avondale in Nichols Hills, and Allie is the senior sales manager at VAST. Some of Kyle Fleischfresser’s keys to success include attention to detail and commitment to quality. After Kyle graduated with a Bachelor of Arts in English from Oklahoma State University, he waited tables to earn extra income while researching graduate programs. His father, Kurt, encouraged him to look into working behind the bar as a way to make more tips. “I started bartending at the Lobby Bar, and I didn’t really know what I was doing,” Kyle said. “One of my regulars came in and asked me how to make this cocktail” that included orange bitters, which inspired Fleischfresser to become familiar with other flavors and spirits. 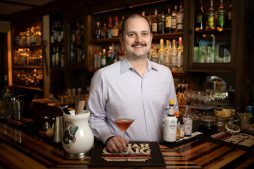 “As I was researching these ingredients out, I realized there is a classic cocktail culture that exists,” Kyle said. He learned the tricks of the trade and quickly became an award-winning mixologist. He then developed the bar menu at Ludivine, a popular farm-to-table restaurant in downtown Oklahoma City, where he incorporated seasonal, regional ingredients into signature drinks. Today, Kyle is the general manager of The Hutch on Avondale. He began renovations and overhauled the restaurant in 2016. Two years later, The Hutch provides quality cocktails and modern tavern dining. Kyle’s general manager duties include overseeing front-of-the-house operations, maintaining the wine selection and assisting employees where needed. Allie graduated from St. Gregory’s University in 2008 with a Bachelor of Arts in dance. Afterward, she worked in event management for a few venues in Oklahoma City. She currently works in management at VAST located on the 50th floor of the Devon Tower in downtown Oklahoma City, and she said she enjoys the opportunity her position provides. Outside of her hospitality career, Allie began leading yoga classes at Body Mind Yoga in Edmond this fall. 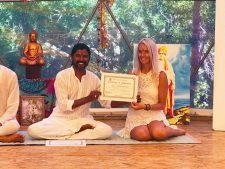 She recently returned from a trip to Mallorca, Spain, where she earned her yoga instruction certificate. (Photo provided) Allie Fleischfresser utilizes her years of dance experience to lead yoga classes. Kyle considers his role in the family businesses his biggest success. “Allie and I are second generation, but my wife (Megan) is the third or fourth generation to carry on the family business. It means a lot to do it — to do it our way — and be successful. “We do not cut corners, and it’s very hard to do things the way we do it and be profitable, but somehow, we still keep going,” Kyle said. To learn more about The Hutch’s innovative spin on classics or to make reservations, check out hutchokc.com, or call 405-842-1000. For those interested in joining Allie’s yoga class at Body Mind Studio, visit bmystudios.com/schedule. The first class is free for new customers, and the studio often holds other free public events.